In the 1930s, a Dutch pediatrician named Willem Dicke began to study a mysterious, often-fatal disease that was afflicting his patients. Children were losing weight and becoming malnourished despite consuming plenty of calories. The symptoms were intense and widespread. Alessio FASANO: The damage is the intestine. This is a systemic disease that does not spare any tissue organ in your body. FASANO: I’m professor of pediatrics at Massachusetts General Hospital for Children. Willem Dicke suspected the illness was somehow related to the children’s diet. But it wasn’t until years later that he found the proof he was looking for. It came in the form of a grotesque natural experiment produced by the Second World War. In 1940, Germany had invaded and occupied the Netherlands. In 1944, Dutch railway workers held a strike in support of the Allies. This prompted the Nazis to cut off food shipments to Dutch civilians. Alan LEVINOVITZ: This was called the Hunger Winter. That’s Alan Levinovitz, a religion scholar at James Madison University. LEVINOVITZ: It was horrific. Children everywhere were starving. LEVINOVITZ: … were actually improving. Then in 1945, the Hunger Winter ended. Bread was dropped over Holland and everyone’s lives improved — except for those of the children , who immediately relapsed into the condition that they had been suffering before. FASANO: And this pediatrician, Dr. Dicke, would reason what we did not have during the war, now, is coming back. That can be the culprit. He made the hypothesis where grains are the culprit. That’s right, grains. Which the kids hadn’t been eating during the Hunger Winter — but now, after bread came back, they were. So Dicke ran a little experiment. FASANO: He took six of these kids, put them on a gluten-free diet, showing that the symptoms were completely gone, put them back on a regular diet, showing that the symptoms came back. That was the cornerstone, and still is of our understanding of how you trigger celiac disease. FASANO: The symptoms unfortunately are not straightforward like many autoimmune diseases. LEVINOVITZ: Jenny McCarthy was hugely influential. Kadee RUSS: I probably spend upwards of $1,200 a month on groceries. 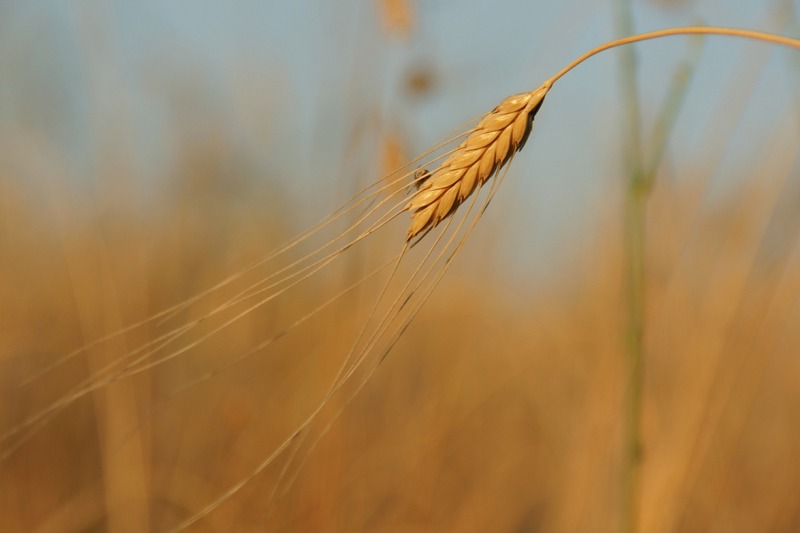 Jennifer BOND: The northern plains of the U.S. have seen declining plantings of wheat. Alessio Fasano is one of the world’s leading authorities on celiac disease and gluten. FASANO: I can’t make that statement myself. But we can. And he is. By the time Fasano started his medical studies, in the 1980s, celiac disease was understood much better than in Willem Dicke’s era. So let’s start with what we know. First of all, the name, celiac. It’s from the Greek, meaning “a sickness of the belly.” And how is the disease defined? FASANO: This is truly an autoimmune disease. It’s like having diabetes, multiple sclerosis, or rheumatoid arthritis. So celiac is an autoimmune disease — with, as Fasano puts it, a recipe containing at least two ingredients. FASANO: 1) A genetic predisposition — many genes needs to come together to make you at-risk. 2) An environmental trigger that is mismanaged by your immune system. FASANO: The immune system starts to attack its own body rather than get rid of the enemy. FASANO: … because the culprit, the enemy, that turn the immune system to attack your own body, is known. And it’s gluten. This known enemy, gluten, is a protein that’s found in rye, barley, and, most prominently, in wheat. Gluten is what gives structure to foods like bread, pasta, and cake. So gluten is the trigger for celiac disease; and the treatment then is what? FASANO: The treatment is the elimination of gluten from the diet. Stephen J. DUBNER: How quickly and how completely does that treatment address the issue? FASANO: Some people will have resolution of the symptoms rather quickly. Others will take much longer. [In] the vast majority, it will be a complete resolution. DUBNER: How does it feel to know that you’re responsible for people crossing those beloved food items off their lists forever? FASANO: Being Italian, I feel awful. It is definitely a tremendous change in lifestyle. No question about that. We face this all the time. A newly diagnosed celiac will go through a serious change and feel [things] from denial to be[ing] upset — to frustrated, to depressed — because one of the most natural [things] to humankind, eating, will become a very challenging mental exercise rather than a very spontaneous activity. Fasano got his medical training in Italy. FASANO: There was a university in Naples where celiac disease was a big deal. Indeed, the University of Naples had a celiac research center; Italian schoolchildren were enrolled in large-scale screening programs. Epidemiological studies showed that roughly 1 in 300 Italians had celiac disease. That’s pretty common! And because it was fairly common, Fasano wasn’t that interested in studying it further. FASANO: One of the reason why I decide to move to the United States was because I was sick and tired [of] talk[ing] about celiac disease and work on it. In 1988, he arrived at the University of Maryland. In the U.S., celiac disease was thought to be much rarer than in Europe: 1 in 10,000 people versus 1 in 300. FASANO: Days passed by, weeks passed by, months passed by, and I didn’t see a single case of celiac disease. I went from the twenty cases a day that I [was] forced to see in Italy, to zero. Fasano’s plan to get away from celiac disease had worked. But he began to wonder why there was such a huge difference. FASANO: I was wondering, “If the genetic background is the same in Europe, and we eat the same gluten-containing grains that they consume in Europe, why is celiac disease so frequent there and does not exist here?” I reasoned, “Either the disease does not exist in United States, so it will be a very interesting proposition to understand why.” And the alternative was that it was overlooked and so was underestimated. FASANO: … I was shocked to know that I had to pay for it. They asked me for $6 apiece. I said, “You must be out of your mind. I would never pay [that] amount of money.” We engage in this back-and-forth negotiation that is actually the heart and soul of the Neapolitan attitude. You never pay whatever they ask for. Eventually they settled on $3 apiece. Fasano bought 2,000 samples and began testing them. If someone who has celiac disease eats gluten, their body produces abnormally high rates of certain kinds of antibodies. Gluten has been recognized as an intruder and their body is trying to fight it off — but instead the antibodies end up attacking healthy cells. This activity can be detected in a blood test. So, when Fasano screened the Red Cross blood samples, what did he find? FASANO: The prevalence was one in 250. A prevalence of 1 in 250! The previous estimate in the U.S. remember, was 1 in 10,000. This new finding would make celiac disease 40 times more common in the U.S than previously thought. Under the old estimate, only 27,000 Americans likely had celiac disease; the new estimate suggested it was more like a million. FASANO: That gave us the impetus to move to this large epidemiologic study on the national scale, in which we recruited more than 40,000 people. This new, national study, published in 2003, yielded an even higher estimate. It found that 1 of every 133 Americans had celiac disease. This was pretty much in line with the most recent European numbers. So America wasn’t so different from Italy after all! According to Fasano’s research, more than 2 million Americans had celiac disease. How was it possible that a disease so well-identified in some places had been practically invisible in the U.S.? FASANO: The symptoms of celiac disease unfortunately are not straightforward like many autoimmune diseases. Intuitively, the vast majority of the symptoms are gastrointestinal: chronic diarrhea, weight loss, failure to thrive. The knock-on effects are various, and serious. FASANO: You can have anemia because you can’t absorb iron and with that, chronic fatigue. You can have joint pain, a skin rash. You can change your behavior because inflammation spills into the brain. You can have infertility. Over the last couple decades, the diagnosis and treatment of celiac disease in the U.S. have greatly accelerated. That’s good news, especially since an effective treatment — the gluten-free diet — is well known. But rather than waiting to be diagnosed, and then going on a gluten-free diet, wouldn’t it be better if we could prevent celiac disease in the first place? If we could understand where it exists, and why, and exactly how it’s triggered? Benjamin LEBWOHL: If you ask someone, “What causes celiac disease?” the pat answer is, “Gluten causes celiac disease.” But I don’t think that’s a fair response. That’s like saying that peanuts are the cause of peanut allergy. Right? That’s Benjamin Lebwohl. He, like Fasano, is a gastroenterologist. LEBWOHL: I’m the director of clinical research at the Celiac Disease Center at Columbia University. Lebwohl and other researchers have looked all over the world for clues that could explain why celiac disease is triggered in one person and not another. LEBWOHL: It used to be thought that people who were susceptible to celiac disease were Irish or Northern European and perhaps, more broadly, Caucasians. But celiac disease is present in Asia. It’s actually quite prevalent in northern India. In virtually every country in the world, celiac disease has been identified. Okay — but: are people who eat a lot more gluten more likely to get celiac disease? LEBWOHL: We know that there is this necessary genetic makeup. We also know that there are regions in the world where the genetic makeup isn’t so different but the environment is quite different and there’s a lot more celiac disease in one spot than another. For example, in India we know that the necessary gene is similarly present in the north and the south of the country. But there’s a lot more celiac disease in the north than the south and it’s not just a matter of increased detection. The going explanation — and I think this is a plausible explanation — is that there is a lot more gluten consumption in the north. Whereas in the south it’s a much more rice-based cuisine. Now, that has not been conclusively proven but it’s awfully compelling when you have a population with a similar genetic makeup but very different gluten levels in their diet and suddenly you’re seeing these widely disparate rates of celiac disease. The answer was wheat. The population there for 4,000 years — whose diet was based mainly on camel milk, camel meat, fruits and vegetables — for the first time in their history, were introduced to gluten. DUBNER: Was it the sudden influx of that diet that triggered it or was it a case of selection among the population just the way that natural selection works over time? Was it related to that? FASANO: The latter. That’s the reason why probably this really reflects the natural history of celiac disease. There were people there were much more susceptible. Remember, once upon a time there was high mortality of celiac disease. The most violent reaction to gluten destroy[ed] the vast majority of the intestine, making intestine not capable to absorb or digest food stuff are the ones that didn’t make it. LEBWOHL: Not everyone knows about the great celiac disease epidemic in Sweden from the mid-1980s to the mid-1990s. But there was one. This was an epidemic that primarily affected the youngest children, so infants and children under two years of age. It typically caused what we call the classical form of celiac disease: babies with diarrhea, failing to grow, etc. Then in the mid-90s, just as rapid as the rise was a rapid fall. The working hypothesis was that it had to do with how those infants were being fed. Rates of breastfeeding were not very high and in general were not overlapping with the first introduction of gluten into the diet. Moreover, infant formula had very high quantities of gluten, which is very different from today. When more overlap with breastfeeding was encouraged and when gluten was minimized from the infant formula, that coincided with the end of the epidemic. But that’s correlation, and we have been hesitant to say that’s causation. There’s another clue from a study in Finland and Russia. LEBWOHL: There was a study that compared rates of celiac disease in two regions very close to each other geographically but very different socioeconomically. These two regions were in Finland and right across the border with Russia in a region called the Russian Karelia. The genetic makeup of those two populations was similar. They both had rates of the celiac disease genes that were comparable. But when screened, celiac disease was present in about one in 100 in Finland and about one in 500 in the Russian Karelia, right across the border. The researchers suspected that income had something to do with it. One theory: lower-income people had more exposure to certain bacteria that somehow protect them from celiac disease. For instance, the bacteria H. Pylori, known to cause ulcers, seems to cut the risk of celiac disease in half. LEBWOHL: We found that, actually, there’s more celiac disease in people who live in ZIP codes of a higher income than those who live in ZIP codes of a lower income. The effect is not large, it’s not very strong, but it’s there and appears to be independent of other factors we controlled for. There’s something about either growing up wealthy or being in a wealthy environment and subsequently losing the ability to tolerate gluten. Okay, so: people are still getting sick from celiac disease, they’re still dying from it, and the epidemiology isn’t locked down. So, given that the disease’s trigger is known, how much sense would it make, as a preventive measure, for everyone to go gluten-free? LEBWOHL: Adopting a strategy of going gluten-free can really backfire. DUBNER: Can we hear the story of your being diagnosed with celiac disease? Emma MORGENSTERN: It was about eight years ago in 2009 and I started having heartburn for about six weeks. Emma Morgenstern is a producer on our show. And she’s the reason we’re doing this episode about celiac disease. MORGENSTERN: I didn’t really get a full diagnosis until I went to see a G.I. specialist. Then he did an endoscopy — where they stick a camera down your throat and take a biopsy of your small intestine — and he did confirm with that endoscopy that I had celiac disease. DUBNER: How hard was it for you to go gluten free? MORGENSTERN: Ugh. [Laughs.] It was just awful. I came to terms with it fairly quickly because I had to. But you start having to think so much about what you’re eating and it’s just it’s a lot of work to be gluten-free. DUBNER: I know that you recently came back from your honeymoon in the south of France. Congratulations. Mazal tov. DUBNER: I know you had a great time. But I would imagine that that is a relatively challenging and tempting place to not be eating gluten, yes? MORGENSTERN: Oh, you mean with the croissants and the baguettes and the pain au chocolat? DUBNER: I wasn’t going to name them by name. I didn’t want to torture you. MORGENSTERN: Yeah, that was a bummer. As much of a bummer as celiac disease has been for Morgenstern, it’s been helpful for us to have a producer on this episode who actually has the disease. Because she knows a lot about it and has been thinking about it for years. But, alas, Emma Morgenstern is a radio producer with celiac disease; for our show, it sure would be nice to speak to an economist with celiac. DUBNER: Hey, it’s Stephen Dubner. Is that Katheryn Russ? RUSS: Hi, Stephen. Yes. You can call me Kadee. Kadee Russ teaches economics at the University of California, Davis. RUSS: I specialize in international trade and finance. Russ had overcome a lot to get to where she is today. RUSS: I’ve had stomachaches and stomach problems since I was very small. I had a pre-term birth due to HELLP, which is another autoimmune disease. I had vitamin D deficiency for years. Anemia for years. These persistent headaches for years. After all of those medical problems, Russ was diagnosed with celiac disease in 2011. RUSS: You read in the news that everyone thinks they have celiac disease or are gluten sensitive. I was really afraid to say anything to the doctor until I thought I had some evidence of it. I went gluten-free for about four months first, maybe closer to six. Just to be sure. Then she told me that I had to eat gluten for six weeks before I could be tested. DUBNER: Were you willing to do that? RUSS: Yeah. I wasn’t sure at first whether or not it was necessary to be tested. It makes a night and day difference. RUSS: First, the way that you’re treated in the medical community. They take the gluten issue very seriously. If you’re admitted to the hospital or something, people need to be watching out for any gluten exposure for you. Second, it’s hereditary. If you test positive for celiac disease, then everyone in your immediate family at least needs to be tested. Celiac disease, if left untreated, shortens your life. It’s very important that people know. Then, also, how seriously you as a person take it. If you know that you have an autoimmune disease, then you’re much more likely to take it seriously than if you think, “I get a stomachache or something after I eat something, so I only take a bite every once in awhile.” Whoa! No. Celiac disease is a totally different world than that. LEBWOHL: … having symptoms that might resemble celiac disease — that are not celiac disease but you still get better on a gluten-free diet. The term for that is non-celiac gluten sensitivity or non-celiac wheat sensitivity. That, again, is Benjamin Lebwohl. A diagnosis of non-celiac gluten sensitivity, he says, is trickier to pin down because there’s no test for it. We asked Lebwohl, therefore, if non-celiac gluten sensitivity is a real thing. LEBWOHL: It’s really counterproductive to question whether non-celiac gluten sensitivity is real. Clearly, the symptoms are real. The suffering is real. I don’t have to tell you how many patients I’ve seen. I promise they’re real. What we don’t know is what exactly is driving their symptoms. What’s the biological basis? Many of them are coming to celiac-disease specialists because they really don’t have elsewhere to go in the area of so-called conventional medicine because there isn’t a well-defined pathway for these patients. There are also plenty of people who go gluten-free apparently because they’ve heard that going gluten-free is a good idea. Here’s a Jimmy Kimmel segment from a few years ago. Jimmy KIMMEL on Jimmy Kimmel Live: Now some people can’t eat gluten for medical reasons, which that I get. It annoys me, but I get it. But a lot of people here don’t eat gluten because like, someone in their yoga class told them not to. I started to wonder, how many of these people even know what gluten is. So we decided to find out. Interviewer on Jimmy Kimmel Live: Do you maintain a gluten-free diet? Interviewee on Jimmy Kimmel Live: I do indeed. Interviewer on Jimmy Kimmel Live: What is gluten? Interviewer on Jimmy Kimmel Live: But what is gluten? Interviewee on Jimmy Kimmel Live: This is pretty sad because I don’t know. LEBWOHL: There are people who go on a gluten-free diet under the assumption, and this is largely a mistaken assumption, that it will promote weight loss. There are probably people who are buying gluten-free food and avoiding gluten simply because of a vague notion that it’s healthier, even though that might not be the case. Among people who are on a strictly gluten-free diet, the great majority do not have celiac disease. The best data we have to date gives an estimate of about 1.5 percent of people in this country being strictly gluten-free even though they don’t have celiac disease. Recent studies suggest that as many as 30 percent of Americans are trying to reduce their gluten consumption or avoid it altogether. FASANO: We went from the complete obsolete, not known, field of what celiac disease is and what gluten really can do to your body to the opposite extreme. FASANO: We did such a good job that now, the awareness of gluten and gluten-free lifestyle becomes one of the most popular if not the most popular diet ever embraced the United States. And this creates a tremendous amount of confusion. LEBWOHL: Adopting a strategy of going gluten-free can really backfire. First of all, because gluten is everywhere it’s so difficult to avoid. It can make eating out, grocery shopping, socializing or dating really fraught. There are also potential health concerns with going gluten-free. Gluten-free substitute foods often have more calories than a gluten-containing item. They often have higher fat content. A gluten-free diet is often a diet low in whole grains, low in fiber. We actually compared people who ate high-gluten diets to those who ate the lowest-gluten diets. We found, actually, that overall, when looking at the outcome of rates of heart attack, for example, there was no significant difference with regard to heart attack risk according to how much gluten you eat in your diet. But if you then take into account whole grains, those who ate more gluten in their diet, due to having a higher whole grain content in their diet, actually had a lower heart attack risk. In other words, a gluten-free or low-gluten diet, if deficient in whole grains, could actually increase the heart attack risk. FASANO: Let me clarify something. Not only gluten is not a villain, but without gluten you and I, we still jump from one tree and another. We [would] not have build the Coliseum or the Eiffel Tower because before the agriculture and, therefore, predictability — humankind spend 90, 95 percent of activity for food procurement and 5 percent for reproduction. No time to unleash ingenuity or doing anything about it. Without agriculture — therefore, without gluten — we would definitely be at the same level of any other species and probably would not be the dominant species. I would personally never, ever recommend a gluten-free diet to somebody that does not have the medical necessity. Myself, I eat gluten. I do this with moderation as we should do for anything. LEBWOHL: A gluten-free diet is also potentially more expensive, particularly if looking at gluten-free substitutes. RUSS: Oh yes. It’s much more expensive. The economist Kadee Russ again. RUSS: I’m afraid to tell you how much I spend on groceries a month. I spend a lot of money. DUBNER: I’d like to know. RUSS: I probably spend upwards of $1,200 a month on groceries. There are three of us in the household. It’s very expensive. You can do just gluten-free and that would probably be a bit cheaper. I’m one of those people that does the gluten-free and tries to go organic, pastured, grass-fed, etc. DUBNER: Tell me what you can about how much more expensive gluten-free foods are. RUSS: — non-gluten-free equivalents. One of the more widely cited studies says 242 percent higher. DUBNER: Wow. Fortunately, you’re an economist. You can answer this question from a price-theory standpoint: how much of that has to do with supply and how much to do with demand? RUSS: I did some sleuthing to try to look into that question. I looked at brownie mix and if we look at a standard national brand, it may cost 12 cents per ounce. Now the lowest cost gluten-free alternative that I could find was 16 cents per ounce. RUSS: Yeah. About a third more. But I don’t know if it was a loss leader or not. The next lowest I found was about 23 cents per ounce. That was also on sale. DUBNER: Now getting into the two times range. RUSS: Exactly. If we take the lowest cost one and then separate out the others, at 30 cents per ounce or more into a premium category, then among those premium categories we see markups of between three and 40 percent. So if the gluten-free diet is less nutritious and more expensive — why would someone who doesn’t have celiac disease, or gluten sensitivity, want to go gluten-free? LEVINOVITZ: Gluten-free came on the heels of the low-carb craze. In the aftermath of Atkins, the idea that carbohydrates are bad for you is still very prevalent. For a population that has been told time and time again that what is making their waistlines expand is carbohydrates, it makes complete sense to think that there’s a hidden villain in these high-carbohydrate foods: gluten. That’s the real culprit. LEVINOVITZ: I’m an assistant professor of religious studies at James Madison University. He’s also the author of a book called The Gluten Lie: And Other Myths About What You Eat. You may be wondering why a religion professor has written a book about diet. LEVINOVITZ: If people reflect on it, they’ll find that diet is actually at the heart of whatever knowledge they have of religion. One of the first things people think of when they think of Judaism is keeping kosher. There are certain foods that are prohibited by God and certain foods that you’re allowed to eat. But Levinovitz doesn’t study Judaism, either. LEVINOVITZ: I specialize in classical Chinese thought as well as the intersection of religion, science, and medicine. Instead of Taoist monks, now we have celebrities. LEVINOVITZ: Jenny McCarthy was hugely influential when she told everyone that she had put her autistic 3-year-old on a gluten-free, casein-free diet. Once you had celebrities coming out against eating gluten-containing foods, you immediately got unscrupulous physicians jumping on the bandwagon. Jumping on the bandwagon and pointing at gluten as the cause of any variety of ailments. It hardly seems to matter that many such claims are light on facts. Food companies, sensing a spike in demand, have been only too happy to supply the supply. You’ll see “gluten-free” tags all over the grocery store these days, as if it’s a symbol of excellence and purity; the same goes for a lot of restaurants. And you can see this shift reflected on a macro scale. BOND: My position allows me to really dig deep into what’s going on in domestic markets for all classes of wheat, as well as crops that are called pulses like dried peas, lentils, chickpeas, which are real popular right now, and dry beans. That’s Jennifer Bond. She’s an economist with the U.S.D.A.’s Economic Research Service. She points out that when it comes to the consumption of certain foods, it’s a lot easier to establish correlation than causality. Furthermore, wheat consumption has had plenty of historical ebbs and flows. BOND: In the 1800s, Americans were eating 225 pounds of flour per person. A hundred years later, that dropped by almost 100 pounds per person. Then it rose again slightly as incomes increased and we had access to more diverse food. Then in the ’70s, there was actually a trend towards increased consumption of wheat again, in part driven by the desire to consume less animal protein. For about three decades, we saw increasing per-capita consumption until the recent high point in the 2000s. Then Atkins hit and put some downward pressure on per-capita consumption for the next seven years. Per-capita consumption began to rebound a little bit, until, perhaps, the emergence of the gluten-free trend — which we are seeing a correlation between per-capita consumption of wheat flour and increasing sales of gluten-free products. Okay, so wheat demand has been all over the place. What’s the current trend on the supply side? BOND: On one hand, we have record-low plantings of wheat and on the other hand, pulse-crops plantings reached a new record high this last year. Again, it’s hard to say specifically that consumer tastes and preference trends are driving the expanded availability of pulse crops. But what the data is showing us is that there has been some pretty steady growth in chickpea and lentil per-capita availability in particular. Pulse crops tend to be grown in the same area as wheat is grown too. The northern plains of the U.S. have seen expanded production of chickpeas, dried peas, lentils, and declining plantings of wheat. LEBWOHL: Despite all of our interest in celiac disease and efforts to raise awareness…. LEBWOHL: … it looks like the majority of patients with celiac disease are still going undiagnosed, and therefore eating gluten possibly to long-term medical harm. Despite that we have all these other people who don’t have celiac disease and have adopted the gluten-free diet. It could very well be that our efforts for outreach and awareness of celiac disease have been basically met on the wrong audience or a different audience. Our efforts to say “celiac disease can affect all races and ethnicities, young and old, the many faces of celiac disease” has not fallen on deaf ears, but fallen on other ears, a different set of ears. Those with celiac disease by and large haven’t gotten the message. I went back to Emma Morgenstern, our producer who has celiac disease, to ask about Lebwohl’s concern with all the undiagnosed cases still out there. MORGENSTERN: We should be concerned about it. Celiac can be really harmful to people who don’t know they have it. DUBNER: I guess one prescription would be for much more widespread screening. But as we’ve seen with a lot of maladies, an increase in screening can also turn up a lot of false positives, which can lead to its own set of problems. How much of a concern is that in the case of celiac disease? MORGENSTERN: I definitely think that’s a concern. I have recently found myself in the position of maybe having been overdiagnosed. DUBNER: [Laughs] For celiac disease? MORGENSTERN: With doing research for this episode I was reading about the recommendations for celiac patients and follow-up, and I realized that I hadn’t actually done any follow-up for almost eight years since I was diagnosed. I decided that I would go to see a celiac specialist. DUBNER: How did that work? He or she looked at your file or ordered up new tests and data? What happened? MORGENSTERN: I was just totally shocked to hear her say that and didn’t quite understand how it was possible that she and my original doctor could come to different conclusions. DUBNER: I have to say that I feel like the story that we’ve been telling in this episode and the image that we’ve been drawing is that it’s a thing that you have or don’t have. But is there that much gradation in the “yes” or “no,” whether you have it or not. Or were you in, maybe, some kind of pre-celiac condition that your original doctor was concerned would tip into full celiac? MORGENSTERN: That is exactly my understanding of it. When they do the biopsy with the endoscopy, they categorize the damage to your intestine on this thing called the Marsh scale. So they categorize the symptoms as Marsh 1, 2, or 3. Marsh 3 is the most severe damage. Marsh 1 is the least severe. I had Marsh 1 symptoms when I was diagnosed, which I didn’t even really think about. I didn’t assimilate that information when I was diagnosed. According to my new doctor, that Marsh 1 symptom level is not enough for her to put somebody on a gluten-free diet. She doesn’t think the original diagnosis was wrong exactly, but she would call it aggressive. DUBNER: I assume the way to test whether you truly don’t have celiac disease is to ingest a lot of gluten. Question number one: does that mean that you have been commanded to go eat a whole bunch of bagels and pizza for a while? Number two: if so, don’t you feel like the world’s biggest sucker for not eating them for eight years? MORGENSTERN: It’s how you look at it. I have been commanded to eat gluten for six to seven weeks and then have an endoscopy. DUBNER: What was the first piece of food you ate with gluten and what did it taste like? MORGENSTERN: I had pizza and it was not that amazing but then I had croissants and those are amazing. That is just something you cannot replicate gluten-free. DUBNER: Are you having any adverse effects? MORGENSTERN: I feel pretty much fine. I’m a little bit worried to say that or superstitious about saying that, but so far I haven’t had any problems. DUBNER: Do you think there’s still a good chance that you actually do have celiac disease? DUBNER: I don’t mean to call you a sucker, Emma, because I’m so fond of you. Let me rephrase it: have you thought about a lawsuit perhaps? Katy MILKMAN from a previous Freakonomics Radio episode: A problem that, if we fixed it, could truly solve every social problem we could think of. The project is called Behavior Change for Good. It’ll involve millions of real-world research subjects, a long list of corporate partners, and one of the most impressive collections of academic researchers we’ve ever seen. Angela DUCKWORTH: We think because this is like the Hall of Justice, with all the superpowers in one place, that we might have a shot at doing something that hasn’t been done before. David LAIBSON: We’re spending hundreds of billions of dollars in colleges and we’re not getting much value for our money. Lyle UNGAR: I disagree actually. And the risks of such a high-stakes enterprise. Danny KAHNEMAN: If they fail, that’s going to be quite costly for a long time. Freakonomics Radio is produced by WNYC Studios and Dubner Productions. This episode was produced by Emma Morgenstern. Our staff also includes Alison Hockenberry, Merritt Jacob, Greg Rosalsky, Stephanie Tam, Eliza Lambert, Harry Huggins and Brian Gutierrez; the music you hear throughout the episode was composed by Luis Guerra. You can subscribe to Freakonomics Radio on Apple Podcasts, Stitcher, or wherever you get your podcasts. You can also find us on Twitter, Facebook, or via email at radio@freakonomics.com. Jennifer Bond, agricultural economist with the United States Department of Agriculture. Alessio Fasano, professor of pediatrics at Massachusetts General Hospital for Children. Benjamin Lebwohl, director of clinical research at the Celiac Disease Center at Columbia University. Alan Levinovitz, professor of religion at James Madison University. Kadee Russ, professor of economics at the University of California, Davis. 30% of U.S. Adults Trying to Cut Down on Gluten, claims NPD Group, Elaine Watson (March, 2013). “Gluten-free and Regular Foods: a Cost Comparison,” Laci Stevens and Mohsin Rashid (2008). Gluten Freedom: The Nation’s Leading Expert Offers the Essential Guide to a Healthy, Gluten-Free Lifestyle by Alessio Fasano, Rich Gannon, and Susie Flaherty (Wiley, 2014). “Pioneer in the Gluten Free Diet: Willem-Karel Dicke 1905-1962, over 50 years of gluten free diet,” by Gerard van Berge Henegouwen and Chris Mulder (November, 1993). The Gluten Lie: And Other Myths About What You Eat by Alan Levinovitz (Regan Arts, 2015). “Prevalence of Celiac Disease in At-Risk and Not-At-Risk Groups in the United States: A Large Multicenter Study” by Alessio Fasano, MD; Irene Berti, MD; Tania Gerarduzzi, MD; et al (February, 2003). “Lower Economic Status and Inferior Hygienic Environment may Protect Against Celiac Disease” by Anita Kondrashova, Kirsi Mustalahti, Katri Kaukinen, Hanna Viskari, Vera Volodicheva, Anna‐Maija Haapala, Jorma Ilonen, Mikael Knip, Markku Mäki, Heikki Hyöty & the EPIVIR Study Group (July, 2009). “Long Term Gluten Consumption in Adults Without Celiac Disease and Risk of Coronary Heart Disease: Prospective Cohort Study” by Benjamin Lebwohl, Yin Cao, Geng Zong, Frank B Hu, Peter H R Green, Alfred I Neugut, Eric B Rimm, Laura Sampson, Lauren W Dougherty, Edward Giovannucci, Walter C Willett, Qi Sun, Andrew T Chan (May, 2017). Celiac Disease Center at Columbia University. Center for Celiac Research and Treatment at Massachusetts General Hospital. “Pedestrian Question — What is Gluten?” Jimmy Kimmel Live (May 6, 2014).